Becoming healthier physically, mentally, emotionally, and spiritually. 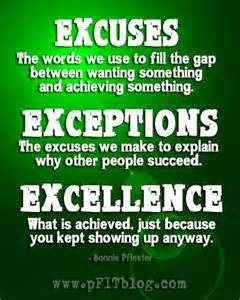 We all, including myself, have made excuses and exceptions when it comes to showing up for workouts. From being too busy to just not feeling like it. But the question we should ask ourselves, "Are we really too busy?" or "Is our body really needing the break or is it we just don't feel like it?". Don't get me wrong, there are times we need to listen to our body and back off, but if you just don't feel like going that's something different. Depending on where you train or what you do, even if it's only 30 minutes, getting in something is better than nothing. If you train with a trainer, like we do at Fitness Together, you probably typically will workout for like 45 minutes. And, with our franchisee owner, Michael Watkins, you have two studios and several options each day to jump into any of the groups. I'm not saying it's always easy or convenient, but aren't you worth making the time for 45 minutes for yourself? So you typically workout in the mornings, and something comes up you can't make it, are you making that an excuse or an exception to just not workout? Or are you going to check out the schedule for that evening and show up to one of those? For me, I personally HATE missing workouts. I workout two to three times a day, and if I miss one due to work or some other reason, I don't tell myself "Well, I've already worked out today so I'm good", no I figure out another session to jump in either earlier or later that day. Or, if there are no sessions I show up and do cardio on my own. I've even just gone home and gone for some "me time" walks. Whatever it is, I know I'm not going to make excuses or exceptions when it comes to my workouts. There have been times when my body has been resistant, and I've learned when I need to back off, but as long as I'm physically okay I'm going to show up for myself. I have goals to meet and I want to achieve EXCELLENCE!